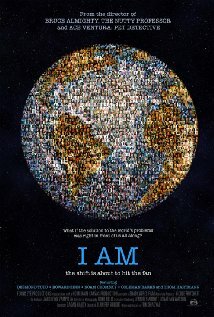 I AM, the latest film by renowned director Tom Shadyac (Ace Ventura: Pet Detective, The Nutty Professor, Patch Adams, Bruce Almighty) recounts what happened to the filmmaker after a cycling accident left him incapacitated, possibly for good. Though he ultimately recovered, Shadyac emerged a changed man. Disillusioned with life on the A-list, he sold his house, moved to a mobile home community, and decided to start life anew. Armed with nothing but his innate curiosity and a camera crew, Shadyac embarks upon a journey to discover how he as an individual, and we as a race, can improve the way we live. Appearing on-screen as character, commentator, guide, and even, at times, guinea pig, Shadyac meets with a variety of thinkers and doers--remarkable men and women from the worlds of science, philosophy, and faith--including such luminaries as David Suzuki, Noam Chomsky, Howard Zinn, Archbishop Desmond Tutu, Lynne McTaggart, Ray Anderson, John Francis, Coleman Barks, and Marc Ian Barasch. An irrepressible Everyman who asks many questions but offers no easy answers, he takes the audience to places it has never been before, and presents even familiar phenomena in completely new and different ways.